Blogmas Day 8 | How to make a Christmas hamper for every budget. Back in the day when Mr Mess and I were still living the highlife on two salaries, one of our favourite Christmas treats was a hamper from the Fortnum and Mason website. Sadly, this is a bit too luxourious for our current budget, but that doesn’t mean we can’t still have something a little special. This year, we decided to create our own Christmas hamper, from a few of our favourite places, to show how to create a luxury Christmas hamper to suit every budget. 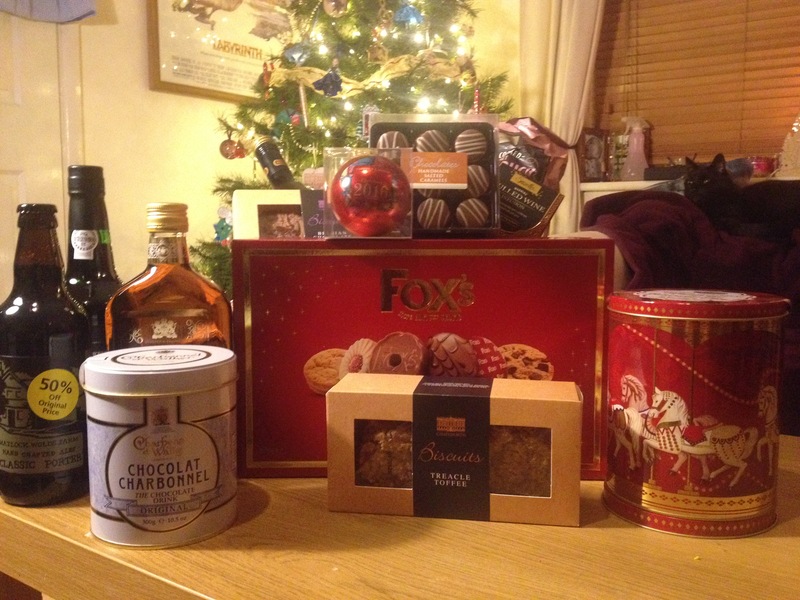 We picked up a few treats from Chatsworth Farm Shop, bulked the hamper out with affordable goodies from Aldi and still managed to buy one luxury item for Fortnum and Mason – for old times’ sake. Here is the finished product. I think it looks rather impressive, even if it didn’t all fit in the hamper! In case you’re interested (and even if you’re not), I’ll give you a little breakdown of all of the tummies to be down in our Christmas hamper. 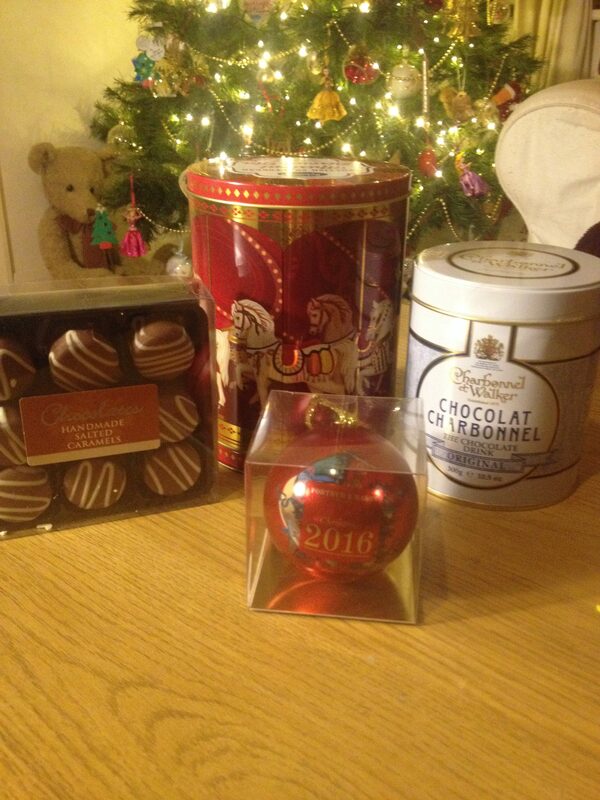 First off was our Fortnum and Mason bauble filled with chocolates. One of my rules when buying things from F&M is that is has to come in a re-usable container. In the past, we’ve gone for biscuit tins and tea caddies, so not only do you get the delicious contents but you also get to keep the container for years to come. This year was no different. The bauble cost about £6.99 ( I think – I can’t find the receipt for any of the products in this post – that’s organisation for you.) 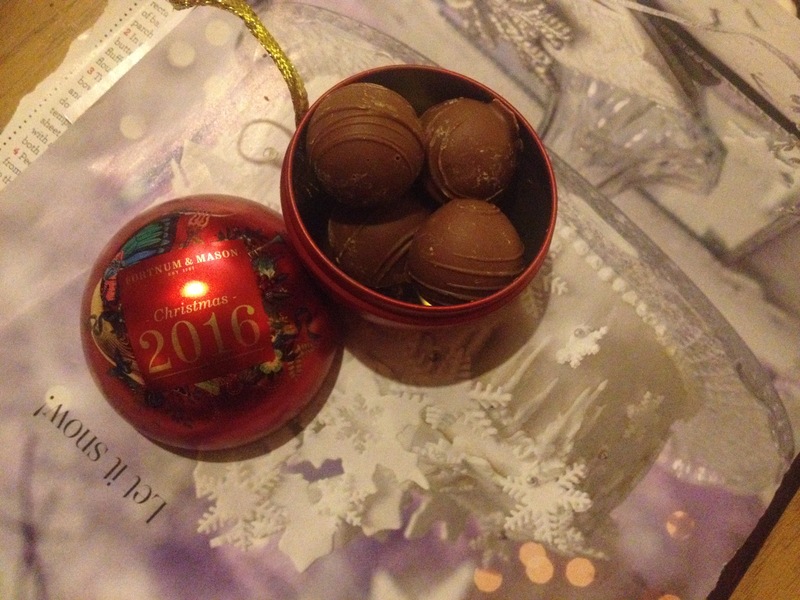 Inside the bauble were 4 delicious chocolate truffles filled with salted caramel. They were amazing but didn’t last long as Mr Mess and I inhaled them in minutes. 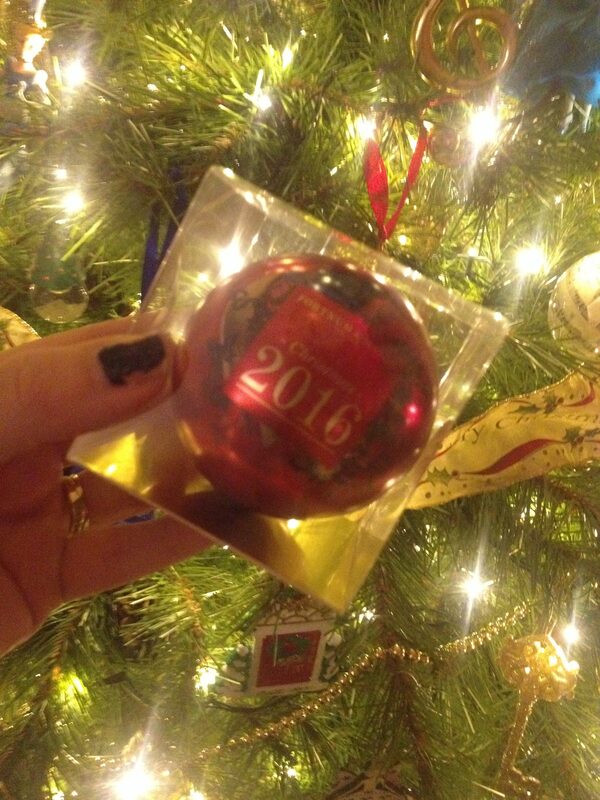 At least the bauble will be able to live on our tree for many Christmases in the future. This hamper was particularly biscuit heavy. What can I say? I love a good biscuit! 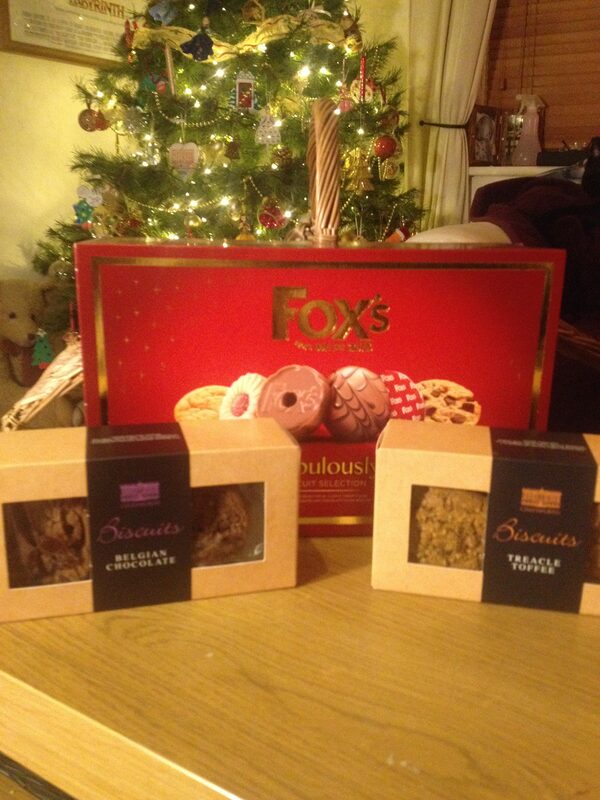 The two boxes in the front are from Chatsworth Farm Shop and are about £3 each. They come in a variety of flavours but I chose the belgian chocolate and treacle. We were give a free pack of these when we honeymooned in the Hunting Tower at Chatsworth and I’ve been a fan ever since. The large pack of Fox festive biscuits came from Aldi, and although I can’t remember exactly how much it was I don’t think it was more than a couple of quid. There are two layers packed with an assortment of delicious biscuits from cookies to creams and everything in between. I’m ashamed to say that most of these haven’t survived the time between photographing and writing this post! Next up was a variety of treats (once again featuring that F&M bauble). The red tin in the back of the photo was once again from Aldi, once again only around £2 and once again contained shortbread biscuits. The best part, though, is that it is a musical tin that rotates when you twist the bottom. Something else for us to keep and refill next Christmas. On the left hand side are some Salted Caramel Chocolates, again from Chatsworth Farm shop. Salted caramel is one of my new obsessions and I’ve been eyeing up these bad boys for a while now. Christmas seemed like the perfect excuse to treat myself. On the right hand side is a very luxurious brand of hot chocolate that we haven’t had in years. Chocolat Charbonnel comes in flakes rather than granules or a powder and is seriously one of the nicest hot chocolates I’ve ever tried. It’s not cheap, at £5 a tin, but it does last for a LONG time. The great thing about Aldi’s prices is that you don’t mind trying something new. If it turns out you don’t like it, you haven’t lost all that much. Luckily for us we liked both of our experimental buys from Aldi. These Confit Duck and Boozy Berry crisps were more-ish and disappeared VERY quickly. I haven’t actually tried this Mulled Wine infused tea yet, but Mr Mess assures me it is very tasty and a refreshing alternative if you don’t fancy a proper glass of mulled wine. Finally, what Christmas hamper would be complete without a little festive tipple. Mr Mess is a big fan of his real ales so he was very chuffed to find this beer from a local Matlock brewery for half price! 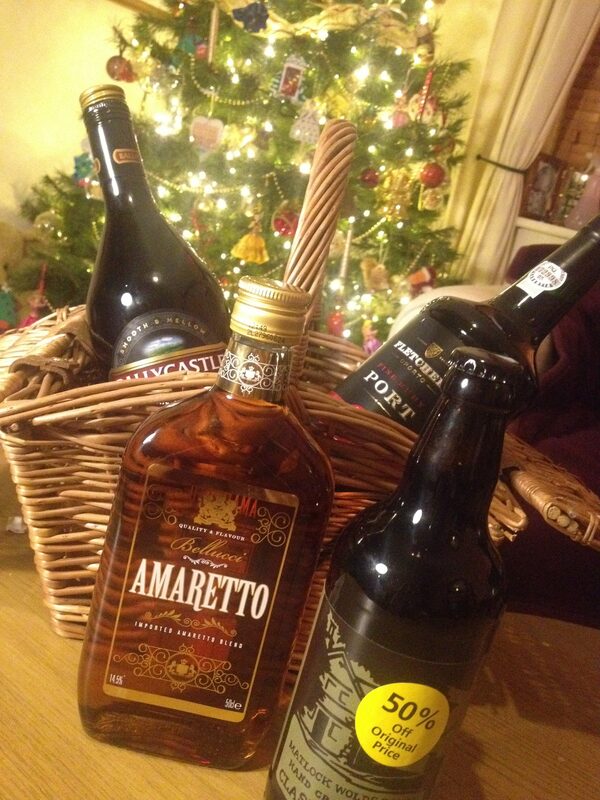 I found the rest of my Christmas booze essentials – Amaretto, Cream Liquer and Port at Aldi for a fraction of the price of the branded stuff. My entire alcohol shop came in under £15 and will no doubt last me long beyond Christmas. I really can’t tell the difference between this and the stuff you’d get in bars. I’m really happy with the way our Christmas Hamper turned out and we’ll certainly have plenty of goodies to keep us going over the Christmas holidays. (Although I have managed to munch my way through a fair few of these things already!) The whole hamper came in around £60 and we got far, far more for our money than you might do at Fortnum and Mason or other luxury retailers. 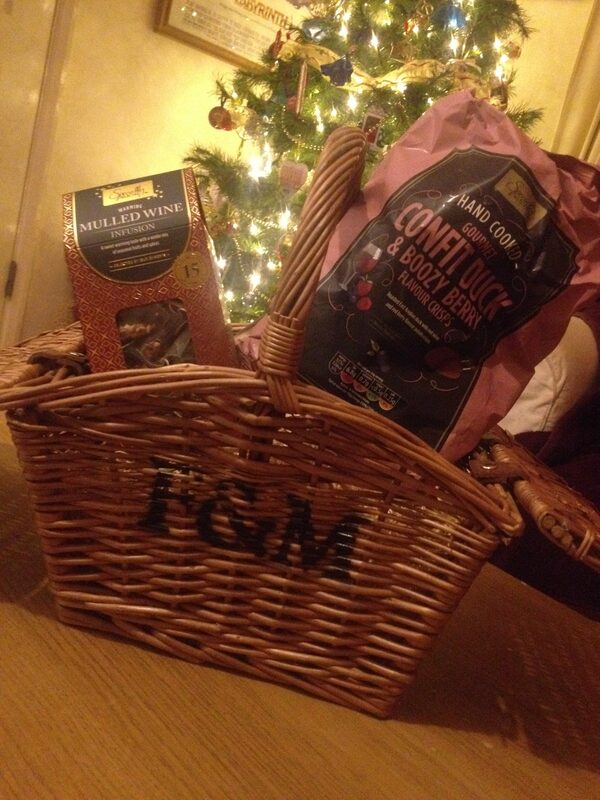 This entry was posted in Blogmas and tagged aldi, Blogmas, chatsworth, christmas, food and drink, fortnum and mason, hamper.